The elite firearms officers pictured at the Met's mock terrorist attack staged in London today are kitted out with the latest high grade military gear. @Scrib You might wanna try your SIG 516 with a SS096 scope like in the pic? The forthcoming Soldier Story Hong Kong SDU agent has a black FAST helmet cover in the same style as the latest Dam FSB agent, so close but not exactly the same. Whoa, this is awesome. I’m way ahead of you! I got a third SIG 516 for $37 and I am planning on equipping it with a spare Leupold CQ/T when it arrives. To see evidence of this exact combination being used in the field is great! You mean the SDU diver that was previewed at the SHCC? The latest DAM FSB was the 78047? These only have Multicam and Atacs. How did you score the 37 one? Mine is still in the box. No time at all at the moment unfortunately. So the seller that I bought my first SIG 516 from for $37? The one that was lost in the Chinese postal system for a couple weeks but eventually arrived? The same seller listed up another complete rifle set for $37! It arrived in the US and should make its way to me next week. Good deals. Did your SS076B arrive? You like the rifle? Any flaws? Apologies, I meant the Modeling Toys SDU. 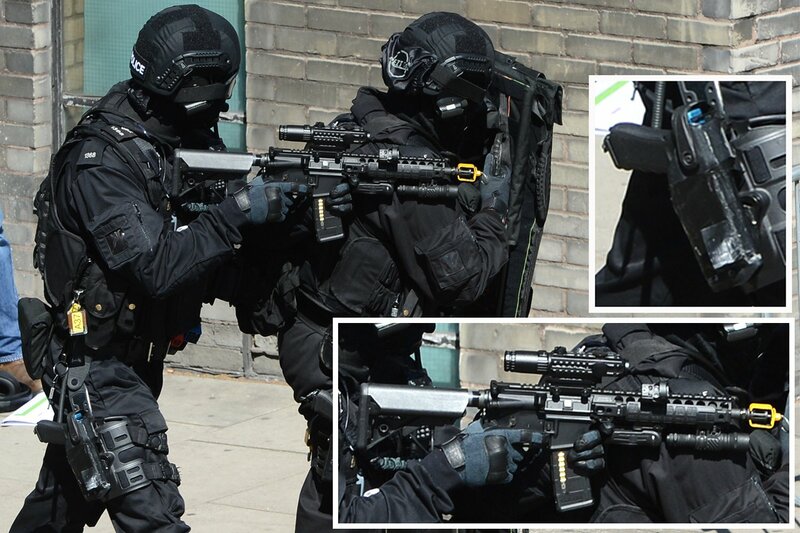 This looks like exactly the same FAST helmet cover as those in the referenced UK CTSFO SWAT photos. Yup, SS076B arrived and I got it set up with no problems. It’s on display at work with some other sixth scale stuff! As you can see, he’s holding an E&S Mk.17 CQB as I’ve added the SS one to a weapon drawer. Nice setup. Makes me wanna take a look at your updated collection pics. Which figure is this P226 with the extended mag, silencer and red dot from? The DAM DEVGRU K-9 handler. All of these weapons are extras of stuff I already have in the collection at home. I’m paranoid! Got one for 36. Will do the same setup as you! 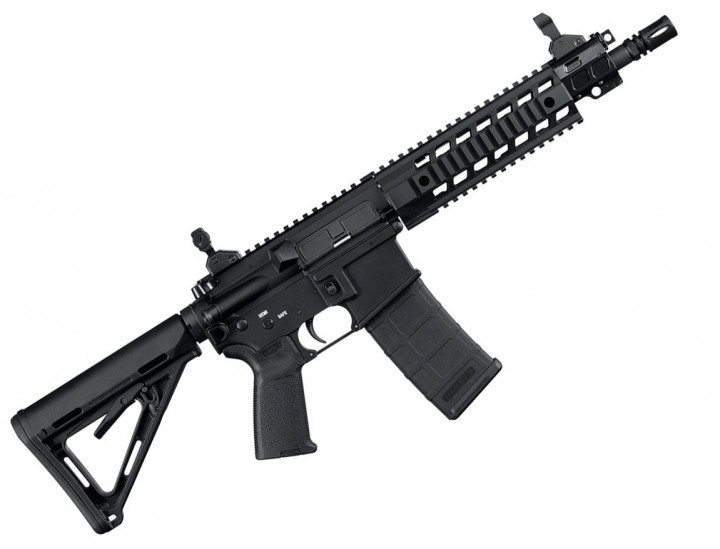 SIG 516 and SIG MCX…what is the difference? Thank you very much chpo!!! And could anyone here point me out to a SIG 516 I can buy? If you can find one you’re probably looking at upwards of $80 or more. I know! That is crazy for a just released figure! I can understand if none were around, but heck! I think I will wait for the tan one…LOL! I thought the M136 AT4 by Soldier Story was expensive. They only produced those for the exclusive and have not made them since. And I paid $80 for that one on ebay more than 5 years ago? Detail is insane on that one. Nice, I only have the old Dragon AT-4 I think. But yeah, prices on weapons are getting ridiculous. Yeah Dave, as far as eBay is concerned, your only options for the rifle set at the moment are $80 or $108…take your pick. The SS AT4 is at the top of my old SS weapons want list. They have shown a figure in winter camo with the AT4 at various shows, getting my hopes up for a rerelease, but that might have been SS109 before they finalized the loadout. SS is notorious for keeping expo exclusive stuff…exclusive, even if it’s just a different coat of paint. Particularly frustrating when the “vanilla” version of the weapon is the expo exclusive and a camoed-up version is the wide release.